St. Louis’s St. Patrick’s Day parade dates back 48 years to 1969. The parade begins at 12:00 pm at Aloe Plaza (20th and Market) and then travels east on Market, to it’s conclusion at Broadway and Clark. 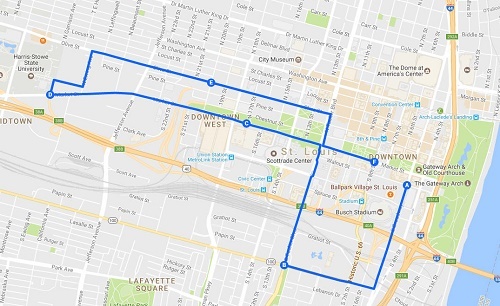 View a larger printable version the St. Louis St. Patrick's Day Parade Route Map here. The parade takes place “rain or shine.” ver 250,000 spectators, the largest of any event in downtown St. Louis, are expected to attend, packing the streets with smiling Irish eyes and festive green attire. Food and drink will be sold at numerous locations along the parade route, serving soft drinks, hot dogs, burgers, and bratwurst, along with snacks, novelties, and beer. In addition, visit Irish Village at Ballpark Village, for food, fun, and entertainment all day long. Find FAQs about the parade here. dignitaries, from Ireland and the St. Louis area. We are launching a family-friendly area to watch the giant helium character balloons close-up as they are being inflated. Come watch as Murphy the Leprechaun, the Irish Flag, and all of the other balloons rise up before your eyes. We will have a volunteer available to answer all of your questions. The inflation will be in Aloe Plaza, near the corner of 18th and Chestnut, between the hours of 8am to 11am. The subway is a great way to get in and out to see the parade. Consider MetroLink or MetroBus, when traveling to downtown. MetroLink stations are very convenient to the parade and the run, and are indicated on the map above. For more information, visit Metro St. Louis (aka Bi-State Development Agency). Find the St. Louis parade's Facebook page here. Irish Village Entertainment Area: parade@irishparade.org.